This scene, near the climax of The Calculating Stars—the first in the opening duology of novels in the Lady Astronaut series—is a pivotal moment for Dr. Elma York, the titular Lady Astronaut. Having survived a meteor strike which wipes out the US eastern seaboard, pilot and mathematical genius Elma is immediately thrown into the heart of the immediate response. Later, when her own calculations make it clear that earth is facing runaway global warming, her involvement switches to a suddenly accelerated space program with the aim of colonizing Mars. To this point, Elma has consistently found her skills as a pilot (a former WASP in World War II) and mathematician under-utilized: because of her position and her marriage to a senior NACA engineer, she is always just outside the room where decisions happen. Using all the resources at her disposal and pushing herself outside of her comfort zone to become the public face of space travel, Elma finally manages to get women recognized as candidates for the astronaut program—only to be confronted, once again, with a panel of men apparently questioning her dedication. Elma launches into her standard speech about the need to send women into space in order that the resulting colonies will be sustainable, only to be stopped in her tracks. No, Elma, don’t tell us about women. Tell us why you want to be an astronaut. Elma's first literary appearance was in a 2013 novella, The Lady Astronaut of Mars, which picks up at the very end of her life. This means that many readers will bring clear expectations to The Calculating Stars and its sequel, The Fated Sky. In our position as narrative time travelers, we know Elma becomes an astronaut; not just any astronaut, either, but the Lady Astronaut. We also know that, by a given point in her life, Elma will have dedicated herself to this career to the highest degree: outweighing family, friendship, or her own life. The Calculating Stars and the Fated Sky put the biggest two steps in that career in context: Elma's journey to becoming an astronaut (in which we learn that the moniker came before, and probably led to, the position), and her contribution to the first Mars expedition several years later. We also learn a lot more about her relationship with her husband, Nathaniel, and the other people involved in the space program, and of the wider political situation of this alternate history. Unlike the rather white Mars of the novelette, Kowal ensures from the outset that The Lady Astronaut novels take place in a world as diverse as our own, with US racial politics playing out in a recognizable way (albeit one that gets a Black astronaut into space some twenty years before our timeline’s Cuban cosmonaut Arnaldo Tamayo Méndez and seventeen before our world’s first African-American astronaut, Guion Bluford). This recognition of diversity, and the way Kowal ties the presence of people of color to the real stories of the US space program, extrapolating from the creation of an “International Aerospace Coalition,” makes the world of Lady Astronaut highly compelling. Elma herself is Jewish and from the American South, and constantly refers to and lives out her cultural traditions as best she can, in the post-apocalyptic circumstances. I did, turning my head with care so I didn't add to my malaise. Our captors had spread out so that two stood at the back of the cabin. Three were at the door, leaving my fan with me. All of the passengers had a greenish-grey tinge, though whether that was from gravity or the situation, I couldn't say. Probably both. Helen had her hands folded in her lap and was wearing the set expression that consumed her when she played chess or did computations. Leonard had his hands tucked into his armpits, sucking on his lower lip while he watched us. Ruby Donaldson's right knee jiggled, and Vanderbilt DeBeer was chewing on the cuticle of his thumb. Beyond the frustration of having Elma still playing the “oops, I don't see race” card nine years after the meteor strike, the Earth First attack raises important questions that the narrative isn't equipped to address through her eyes. Elma's excuse for the white crew is that these are the best qualified candidates, a line in-keeping with her own personal journey but deeply unsatisfying if one wants a more holistic inclusion narrative to play out. Because we only see the space program through Elma's eyes, and because the narrative has set her up to be the perfect candidate for her own seat at the table, The Calculating Stars and The Fated Sky seem to largely accept that the fight for inclusiveness ends when organizations can find individuals who have already managed to obtain the right skills and opportunities to do the job, and let them get on with it (except when it comes to laundry in space). Indeed, one of the climactic events of The Fated Sky involves an accident precipitated by Ground Control’s refusal to use the most qualified Black astronaut for an important spacewalk: an incident that it must be noted, causes the only textual gay relationship in the novel to end in tragedy. The problem is, as long as we are purely inside Elma’s story, there is no way to square the circle of her own ambition, and a politics of inclusion that goes beyond the non-intersectional hierarchy of “least marginalized first.” In The Calculating Stars, Elma manages to get the space program opened up to women, but is powerless in the face of structures that prevent women of color from qualifying due to their lack of experience flying in World War II. She then arguably spends more time getting frustrated at the lack of qualifications among the white women in the final program, and the lack of serious expectations among those preparing them for space. 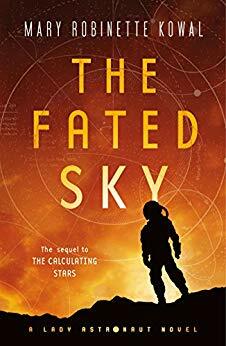 In The Fated Sky, Helen Liu, the only woman of color from The Calculating Stars who plays a role past Chapter 1, ends up sidelined by Chapter 5. Why? Because Elma unwittingly takes her place on the Mars mission, having not done the work—despite having all the facts at her disposal—to figure out that the position she was offered would be at Helen’s expense. To be fair, Kowal allows Helen, and other women of color, to be angry and unforgiving of how Elma uses her privilege; but the reader’s experience of this anger is then filtered through Elma’s own feelings, portraying these women in a more negative light than those who she finds more accommodating. This portrayal ends up affecting particularly Black women: Sarah Coleman, one of the pilots in The Calculating Stars, and Florence Grey on the crew of the Niña. Of course, we know the character from The Lady Astronaut of Mars will step over anyone to go to space. However, putting Elma in a position where she crushes the ambitions of an equally qualified woman of color, then shrugs and carries on, is a narrative choice which greatly reduces my sympathy for Elma as a character. Throughout her journey, Elma also has the luxury of floating in and out of supportive relationships and groups according to her own needs, to the extent that it takes her years to learn the preferred nickname of Kamilah, one of her crewmates on a seven-person ship on the journey to Mars. When Elma does seek validation, it is either from Nathaniel or, more problematically, from her antagonistic relationship with Colonel Stetson Parker. It transpires that Parker dislikes Elma because she used her position as a general’s daughter to report him for sexual harassment of her fellow WASPs without destroying her own career. Needless to say, the allegations have no impact on Parker’s own career trajectory (stop me if you’ve heard this one before): he ends up becoming one of the IAC’s first astronaut candidates, the first person in space, and, after having and then recovering from a major medical condition, one of the crew of Elma’s ship to Mars. 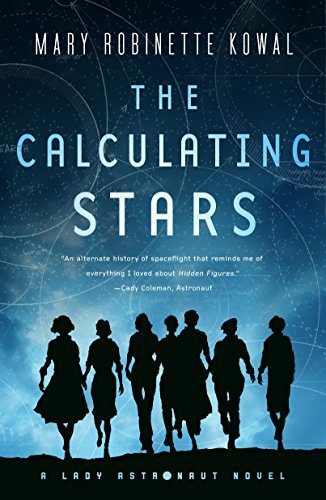 In The Calculating Stars, Parker spends a great deal of time trying to keep Elma, and, by extension, all women out of the astronaut corps, at one point resorting to blackmail to do so, although the book seems oddly fixated on showcasing Parker’s redeeming qualities in other areas, such as his being able to learn languages and treat Black people as human beings. In The Fated Sky, this history is largely glossed over, with the sexual harassment allegations brought up and discussed only in the context of how they affect Elma and Parker’s working relationship. Parker never expresses remorse for his treatment of the WASPs, but he is nevertheless treated to something like a redemption narrative, as Elma eventually succeeds in winning his emotional trust. That this is portrayed as a positive, climactic moment for the two feels completely wrong in a modern context: Elma was not one of Parker’s victims and has no business bestowing even unstated forgiveness for his general treatment of women. Yet The Fated Sky encourages us to accept that the individual reconciliation between the two is a significant turning point in the narrative as a whole: a reading that is only possible if we believe that Elma’s feelings are more important than the structural context in which she operates. The other significant drawback to focusing this narrative solely on Elma is that it reduces the scope for a truly international space program, with all the additional political intrigues that would entail. Given how little is being done to combat climate change in our timeline, there's something fundamentally utopian about an alternate history that frames the space race not as a conflict-driven competition between the USA and the USSR, but as a collaborative international effort to address a problem that won't fully express itself within the protagonists' lifetimes. However, it's US domestic forces that drive the story, with a few nods to other contexts, in particular a—to modern audiences—highly unprofessional white South African astronaut in The Fated Sky. Beyond this, there's little to indicate how global politics might have played out differently in Elma's world. How did the strike affect decolonization, given that the vast majority of Africa and significant parts of Asia (including Cambodia and Laos) was still under the colonial rule of European powers at this point? How did internal Chinese politics play out differently, with famines striking years before the politically-motivated mass starvation of the Great Leap Forward? Did the European Coal and Steel Community, founded in 1951 and implemented in 1952, occur as planned, and how did international cooperation in the space program affect the wider project of European unity? The Lady Astronaut has no answers to these questions, bringing the “International” into “IAC” exclusively through the individual experts, with any political resonances of their identities feeding into a purely US-American context. Even the Mars mission spaceships are “lovingly dubbed” (though probably not by any Native Americans in the IAC) Niña, Pinta, and Santa Maria (The Fated Sky, p. 69): names which have resonance for US Americans but are highly implausible in the context of an international space program. In my experience, the more technical the issue, the more likely that the non-technical aspects, in this case the ship names, precipitated the most heated and lengthy discussions of any high-level political meetings. My deepest frustration with the Lady Astronaut novels, therefore, is that they seem to play out a story too small and too conservative for the alternate history to be satisfying. Elma, for all her flaws, is a compelling character, but she is a flawed and limited feminist hero: a fact which the narrative accepts but fails to mitigate. By giving us a white-presenting, highly ambitious woman capable of calculating orbital trajectories in her head but not of noticing how many black people are in a spaceship, the Lady Astronaut narrative becomes one of “leaning in”; as in our own world, we are encouraged to accept “trickle-down equality” where those least marginalized get to go first and anyone who isn’t an overqualified white woman or Black man should sit tight and wait their turn. That we see Elma, in her own career, both promote and step over equally qualified women of color exposes this for the lie it is. So why does Elma want so badly to be an astronaut? Despite her surprise, Elma quickly comes up with an answer to the interview committee in The Calculating Stars, and as readers we perhaps shouldn’t be surprised at what it is. When encouraged to consider her motivations as herself, not as the "Lady Astronaut," she talks about her father, and how he introduced her to science fiction and shaped her dreams. She also talks about being a pilot—a career that we know, from earlier in the text, that he introduced her to as well. That General Wexler looms so large in his daughter's career ambitions is unsurprising, but I find myself desperately wishing Elma had spent less time aspiring to become her father and more time looking at how to raise up those around her. The world of the Lady Astronaut could be so much more than her perspective allows. Adri is a semi-aquatic mammal currently living in the UK, where she divides her spare time between reading, interacting with dogs, and making resolutions about doing more baking. She is a regular contributor at Nerds of a Feather, Flock Together and can also be found at Adri's Book Reviews or on Twitter at adrijjy.